The new Adidas design remained the same from the 1977/78 season, with one very slight modification. 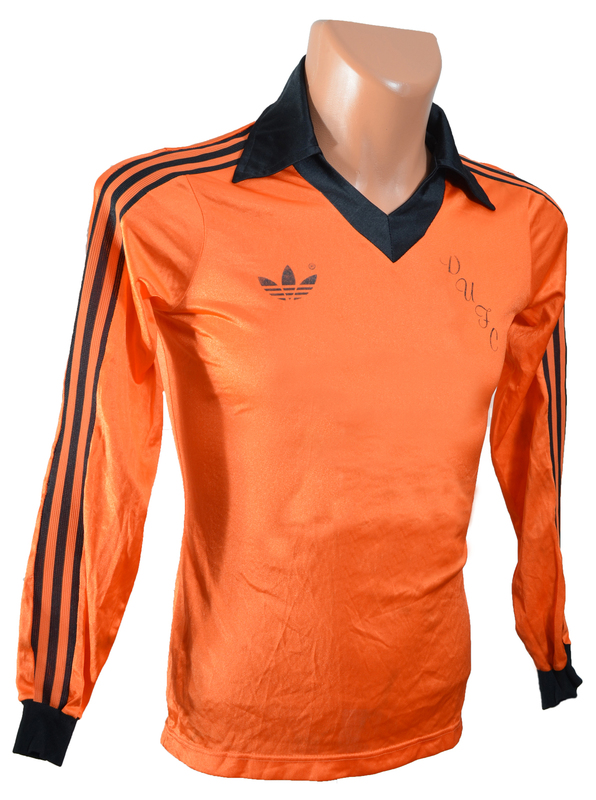 The polyester tangerine shirt still had the three stripes down the sleeves, and the collar was still the black V neck with black lapels style as before. However, the badge design of the horizontal DUFC text that had arrived the previous season was now changed back to the diagonal text that had been on the shirt from 1973 to 1977. The Adidas logo on the right breast was now accompanied by the manufacturers name below the motif. The kit was probably first worn competitively in the opening match of the 1978/79 season, in a 0-0 draw with Hibernian at Tannadice in August 1978. This was now the classic United kit that everyone associates with the Clubs most successful period, as it was worn from 1978 to 1983. During this time the Club won their first major trophy when they defeated Aberdeen 3-0 at Dens Park to win the 1979 League Cup, and they retained the trophy the following season when they won what is probably the single biggest Dundee derby in history to lift the 1980 League Cup. The last season the kit was used was the 1982/83 season, where United pipped Celtic and Aberdeen at the final hurdle to clinch the League title to become Premier Division champions in May 1983. The shirts last appearance was the decisive match at Dens Park where United ran out 2-1 winners against their neighbours to become Champions of Scotland for their first and only time so far. As an aside, it is interesting to note the changing size of the lapels on the collar of this kit since the first version of it in 1977 through to its final appearance in 1983. Obviously in keeping with the fashions of the time, the large collar of the late 1970s was about half the size by the time United won the League.